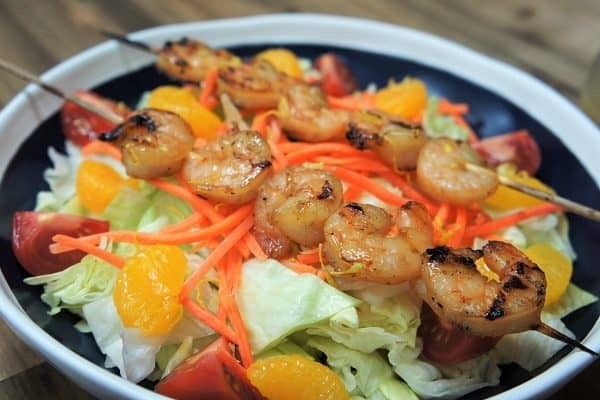 You can prepare some, or most, of the ingredients in advance and refrigerate until ready to build the salad. The diced tomato, I would prepare when making the salad, but everything else will keep just fine in the refrigerator for a day or so. If you’re using a hothouse (or English) cucumber, peeling and seeding is not necessary. If using a garden cucumber, then you may want to remove most, or all of the peel. Also, slice the cucumber in half and gently remove the seeds with a spoon. Stovetop: Add the bacon to a large, non-stick skillet and cook over medium heat until crispy. Turn the bacon occasionally at first, then more often as it starts to brown. Remove the bacon from the skillet and place it on a paper-towel lined plate. When the bacon is cool enough to handle, chop or crumble into small pieces. Oven: Preheat the oven to 350°F. Line a large baking sheet with parchment paper. Place the bacon on the baking sheet so they fit comfortably, do not overlap. Bake the bacon until beautifully browned and crispy. This will take approximately 25-35 minutes, but check the bacon after 15 minutes, and gauge the rest of the time from there. Check it often (because burning bacon would be sad). Remove the bacon from the oven and place it on a paper-towel lined plate. When the bacon is cool enough to handle, chop or crumble into small pieces. Carefully place the eggs in a medium saucepan. Cover the eggs with cold water. Place the pan over high heat; bring the water to a full boil. Once the water is boiling vigorously, turn off the heat, cover the pan and let the eggs sit for 10 minutes. Drain the water and then rinse the eggs with cold water. Peel the eggs when they’re cool enough to handle, and chop. 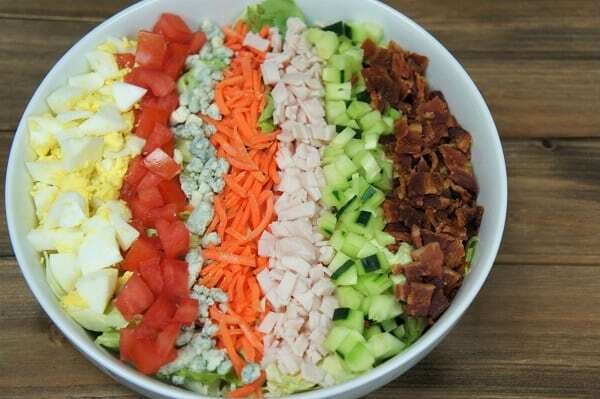 When all of your ingredients are sliced, diced and chopped – build your cobb salad. Divide the lettuce among two large bowls or to-go containers (if prepping lunch). Use half of the toppings for each salad. 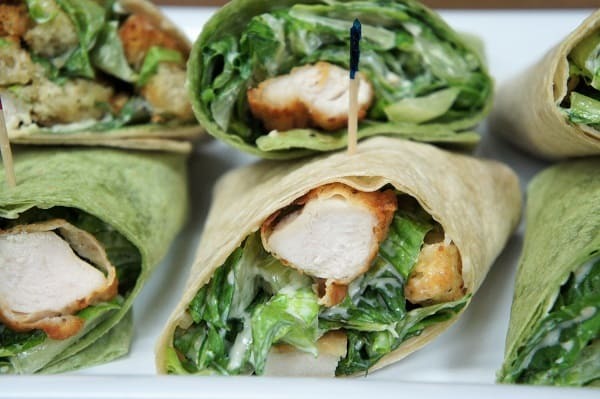 Add one ingredient at a time to the lettuce. We arranged the toppings in neat rows. Start in the middle and alternate sides until all the toppings are used up. 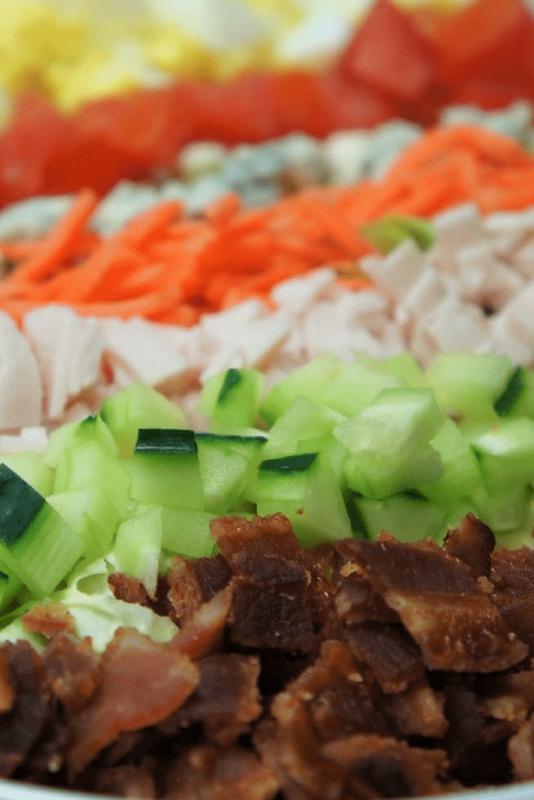 Serve the cobb salad with your favorite salad dressing and enjoy! If your prepping you lunch remember to pack some dressing on the side and refrigerate.